You wouldn’t believe the state I was in when The Blue Cross rescued me. My name is Sweetpea and I’m one of the many horses and ponies rescued and cared for each year by The Blue Cross. You may remember helping my friends at the equine centre last year. That's why I’m writing today to tell you my story and ask for your support in helping to keep horses like me healthy, safe and free from suffering. My story begins soon after my owner abandoned me. I was wandering, lost, confused and frightened near a small Oxfordshire village. Fortunately, some local residents found me and called The Blue Cross. Thank goodness they did, because I was in a bad way. I had deep cuts around my eyes and bruises all over my back legs. My spine had been so badly injured that I could hardly move my neck for the pain. Many people would have given up on me, but The Blue Cross were prepared to do all they could to give me the chance of a happy life. They took me to their vet who said I was undernourished, dehydrated and had a damaged spine. He treated my cuts and bruises, gave me medicine and put me on a re-hydrating fluid drip. It was touch and go for a while, and I wasn't sure I'd make it. In all, it took more than a week of treatment before I could even leave the vet’s surgery. Finally, when I was well enough, The Blue Cross took me to the Burford Equine Welfare Centre. 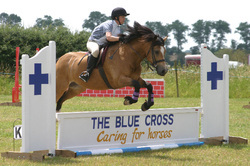 It’s one of three centres where The Blue Cross provide care for vulnerable horses and ponies. When I got there, I was feeling much better. My neck was on the mend, but I still couldn't move it enough to eat or drink without help from one of the Blue Cross grooms. But over time, and with plenty of care and attention, I grew stronger. There are many other horses and ponies here at the centre. Not all of them were mistreated like me. Some come from homes where their owner was unable or couldn’t afford to look after them properly. And some, through no fault of their own, proved too difficult for their owners to cope with. Caring for vulnerable and neglected horses like us takes time, patience and money. Did you know that a week’s worth of feed costs £15. A course of vaccinations is £90. And an outdoor rug to keep me warm costs a full £100! Will you make a contribution today to help horses and ponies like me? The Blue Cross receives no government funding at all. So anything you can give will go a long way towards giving us the care and attention we desperately need. Today, thanks to The Blue Cross, my injury is much better. It hasn't completely healed, but I am free of pain. I still need regular care and check-ups from the vet and my neck wound means that I can never be ridden. But there’s a good chance that The Blue Cross will be able to find me a new home as a companion to a riding horse. The Blue Cross rescued me and saved my life. But there are still so many horses and ponies suffering from abuse, cruelty and neglect. Your donation will help relieve their misery and give them the safety and security they deserve. So please, if you can, complete the donation form and send it back to us today. You’ll be making a real difference to so many lives. 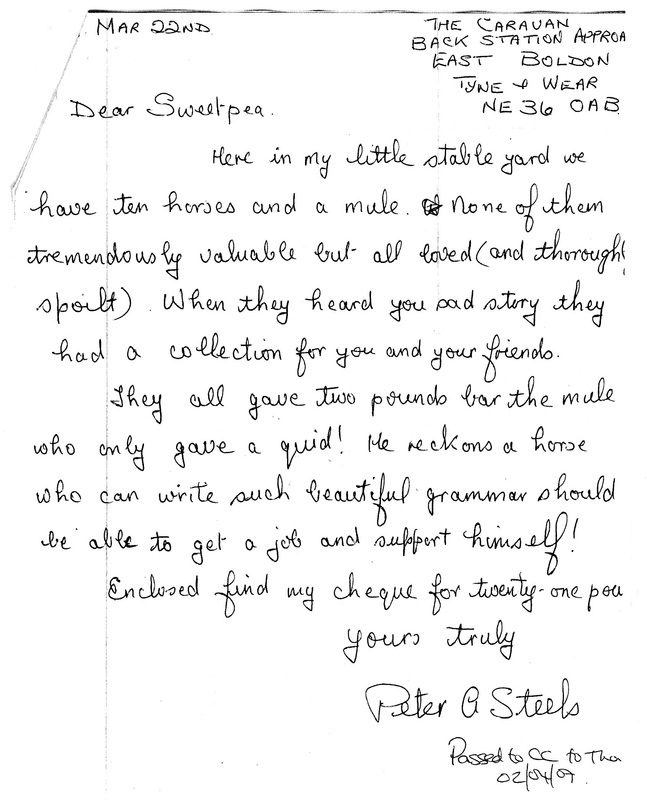 From Sweetpea and all of us here at The Blue Cross Equine Welfare Centre, a big horsey THANK YOU. The Blue Cross believes that every companion animal should have a caring home. This was me soon after The Blue Cross rescued me. It’s hard to believe that I looked such a mess. After a few weeks of care, I was already looking a little better. A few months later, I’d put on a bit of weight and my coat was starting to shine. And look at me now! I look pretty good, even if I say so myself.